Dimensions 1.25 by 6.25 by 9.50 in. Amazon.com description: Product Description: How do students learn to reason and think about complex issues? 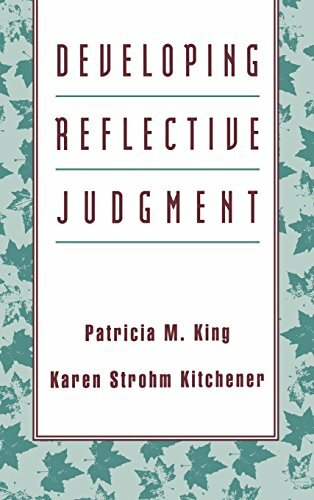 This book fills a critical gap in our understanding of a long-neglected facet of the critical thinking process: reflective judgment. Drawing on extensive cross-sectional and longitudinal research, King and Kitchener detail the series of stages that lay the foundation for reflective thinking, and they trace the development of reflective judgment through adolescence and adulthood. The authors also describe the implications of the Reflective Judgment Model for working with students in the classroom and beyond--encouraging educators to think differently about interactions with their students and to create ways of more effectively promoting the ability to make reflective judgments. About: How do students learn to reason and think about complex issues?